THEMIS results show winds have scoured many areas of Martian bedrock clear of sedimentary debris. Scientists working with data from the Thermal Emission Imaging System (THEMIS) onboard the Mars Odyssey orbiter have found substantial areas of Mars that appear to be blown clean of sand and dust. THEMIS' infrared images have also detailed individual rock units, identifying both major outcrops as well as detached parts of the same rock units lying some distance away. The rock layers show varying thicknesses, suggesting that conditions changed, either when the rocks formed or when erosion worked on them afterward. In places, exposures of bedrock extend for kilometers (miles). On smaller scales around craters, THEMIS has mapped distinct differences in ejected rocks and debris. These suggest variations in the debris' physical properties, and in the ages of the craters. Comparing THEMIS' nighttime infrared images with daytime visible and infrared images provides a sensitive look at the nature of surface materials - even where the rocks and debris are too small for any orbiting camera to photograph directly. THEMIS distinguishes rock, gravel, sand, and dust by looking at these materials in the infrared to see how they respond to daytime solar heating and to nighttime's chill. During the day, dusty expanses rise to higher temperatures than do rocky areas. Larger particles, such as sand grains and gravel, heat up less than dust and can behave more like rock, if the grains become crusted or cemented together. By day, therefore, THEMIS' infrared images see bright, warm dusty patches mixed with cooler and darker expanses of rock. At night, the scene reverses. Dust cools off quickly, dropping to temperatures far below those of the rocks, which keep their daytime warmth better. Deep in the Martian night, rocks have temperatures about 20° to 50° C (36° to 90° F) warmer than exposed dusty surfaces. Looking down from orbit at night, THEMIS sees the infrared glow of rocks at the surface and those lying on the slopes of canyons, craters, mesas, channels, and fissures. Rocks also surround impact craters in THEMIS' temperature images. When a meteorite impact makes a crater, it throws out rocks and other debris in a roughly radial pattern. Except where eroded or blanketed thickly by dust, these patterns show temperature effects that point at physical differences. 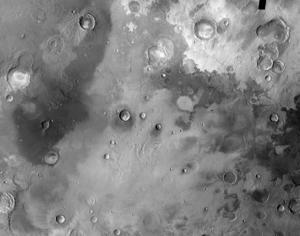 Close to the crater's rim, ejecta tends to be larger, coarser, and more rocky, while smaller particles lie farther out. As a crater ages, dust settles from the air on rocks and fine-grain debris alike. Unless the dust is swept away by the wind, its slow accumulation will gradually erase the day/night differences. Christensen, P.R., J.L. Bandfield, J.F. Bell, III, N. Gorelick, V.E. Hamilton, A. Ivanov, B.M. Jakosky, H.H. Kieffer, M.D. Lane, M.C. Malin, G.L. Mehall, T. McConnochie, A.S. McEwen, H.Y. McSween, Jr., J.E. Moersch, K.H. Nealson, J.W. Rice, Jr., M.I. Richardson, S.W. Ruff, M.D. Smith, T.N.Titus, and W. Wyatt, Morphology and composition of the surface of Mars: Mars Odyssey THEMIS results, Science, 300, 2056-2061, 2003. THEMIS data let scientists distinguish numerous rock units on Meridiani Planum using day/night temperature differences. In this daytime infrared image, darker areas are rockier, lighter ones are richer in dust. The image is about 590 kilometers (370 miles) wide. The bedrock is less obvious in this visible light THEMIS image of Nili Patera, but the dunes show clearly. 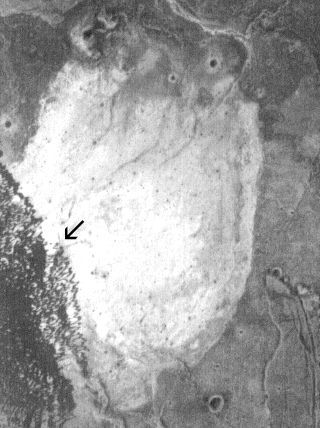 Note the V-shaped dune (arrow), which is also just detectable in the nighttime infrared image above. This image (V05952017) is 18 km (11 miles) wide. The MOC imager on Mars Global Surveyor reveals details of Nili Patera's dunes in this image, which is 3 km (1.9 miles) wide. The dunes' classic "barchan" (crescent) form shows the wind has driven them from right to left. 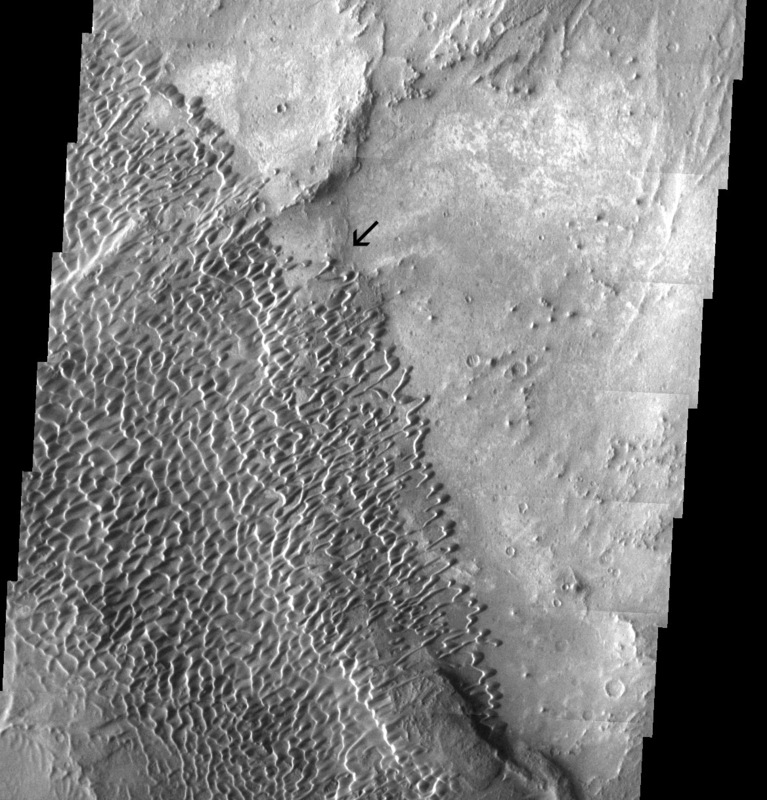 Note the V-shaped dune, top center. 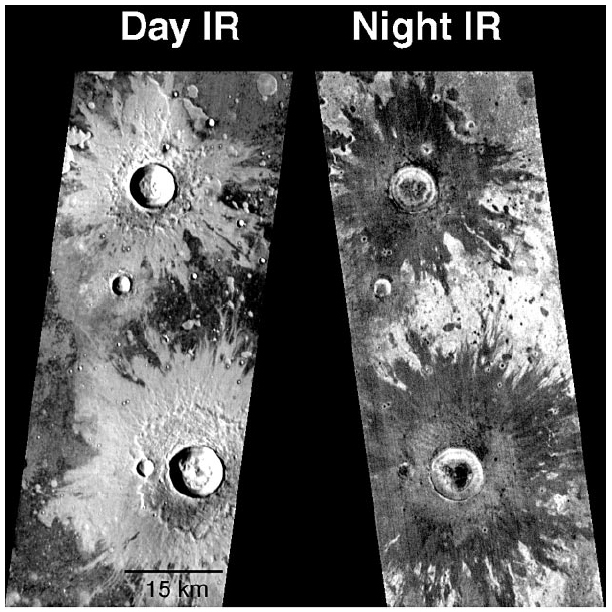 The same two craters look different from daytime infrared (left) to nighttime infrared. By day, brighter areas mean warmer and dustier terrain while darker indicates more rocks. The pattern reverses at night, as rocks stand out by their warmth. The images — I02685009 on the left and I01980010 on the right — are each 32 km (20 miles) wide.